in 3mm, 5mm and 7mm thicknesses. But, don’t let these low prices fool you! My MAKO wetsuits are made from 100% Genuine Yamamoto neoprene from Japan. 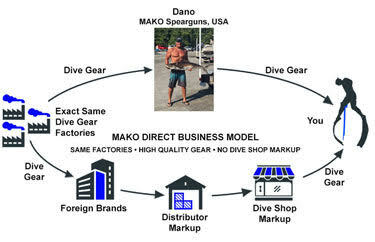 wetsuits actually cost less than non Yamamoto suits sold at dive shops. ALL ADULT MAKO/YAMAMOTO WETSUITS ARE GENDER SPECIFIC. If you are a man, you want a wetsuit made for a man. If you are a woman, you want a wetsuit made for a woman. Our suits are NOT UNISEX CUT! Last edited by MAKO Spearguns; 10-16-2018 at 07:11 PM.